Sam Alex (right) has become a nationally renowned radio host by interviewing the likes of country music star Kenny Chesney. He got his start behind the microphone playing Vince Fontaine in his high school’s production of Grease. Only a few years ago, he appeared as himself on an episode of ABC-TV’s Nashville interviewing country music celebrities on the red carpet. The man behind the microphone is Sam Alex ’07. He has come a long way since he arrived at Illinois State as an aspiring broadcaster. Alex is now the host of Taste of Country Nights, a country radio show that broadcasts live from Nashville, Tennessee, and is nationally syndicated on over 100 stations. He is also a special correspondent for the syndicated entertainment news magazine television show Celebrity Page. In 2016 he was nominated for an Academy of Country Music Award for National On-Air Personality of the Year. 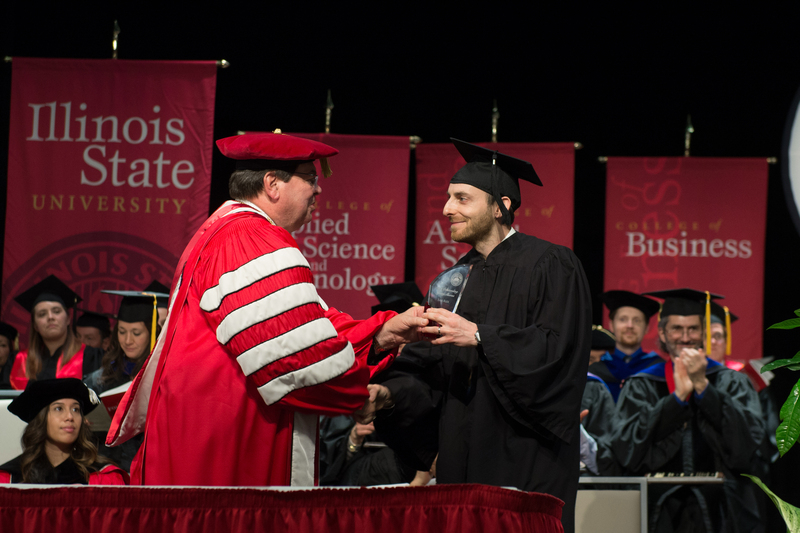 Sam Alex receives the Outstanding Young Alumni Award from Illinois State University President Larry Dietz at the 2019 Founders Day Convocation. The week before his first year at Illinois State he walked into the athletic director’s office and asked if there were any opportunities for him to work behind the microphone. To his surprise, he was offered the opportunity to call a women’s soccer exhibition game the next night, which led to a four-year stretch announcing soccer games and other sports. He also worked at Illinois State’s student-run radio station, WZND, during his freshman year as a sportscaster and newscaster. That experience helped him land an internship at B104 WBWN, a country music radio station. Alex is living his dream job and loves entertaining and informing his listeners. Prior to hosting Taste of Country Nights, Alex worked for WMZQ in Washington, D.C., WRRM in Cincinnati, and WBWB in Bloomington, Indiana. Now a typical day for Alex could include attending a party for artists like Garth Brooks or Luke Bryan, getting a behind-the-scenes look at a new tour, or sitting down for an interview in the studio with Dolly Parton or Trisha Yearwood. Alex can be heard on Bloomington-Normal radio station 107.7 the Bull weeknights from 7 p.m. until midnight. Alex has stayed involved with his alma mater. 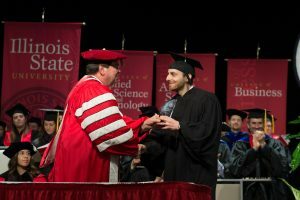 He is a leader of the Nashville Area Alumni Network for Illinois State and has organized viewing parties for athletics events, festivals, and winery tours for local alumni. He is an ambassador for Get Caught Reading, a nationwide campaign to remind people how much fun it is to read. Lyndsie Schlink can be reached at laschl2@IllinoisState.edu.